FILE - A Congolese health worker administers Ebola vaccine to a woman who had contact with an Ebola sufferer in the Democratic Republic of Congo, Aug. 18, 2018. Scientists now say they have a treatment for those ill with the deadly virus. 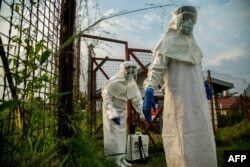 In the Democratic Republic of Congo, more than 600 people (580 confirmed and 48 probable), have contracted the Ebola virus, with 383 deaths reported, according to figures released January 10 by the World Health Organization. The spread of virus has been difficult to contain because of an ongoing conflict in the country's east, despite medical advances, including a vaccine. The DRC is where Ebola was first discovered in 1976, when the country was called Zaire. The disease was named after the Ebola River where the virus was spreading. Between then and 2013, there was no treatment or a vaccine. The outbreak ran its course in quarantined communities. FILE - Tom Geisbert, right, a professor of Microbiology and Immunology at the University of Texas Medical Branch, explains to Texas Gov. Rick Perry the work researchers are conducting in a Bio Safety Level 4 lab in the Galveston National Laboratory, Oct. FILE - Medical staff are sterilized before entering the isolation unit at a hospital in Bundibugyo, western Uganda, on Aug. 17, 2018, where there is one suspected case of Ebola.